Crush soda crackers. 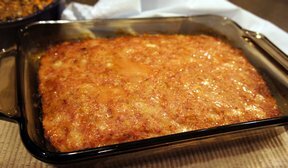 Combine ham loaf, crackers, eggs and milk. Mix well. Place mixture in 9x13" glass dish and shape into loaf, leaving some space around the perimeter of the dish. Put loaf in the oven and set timer for 30 minutes. Meanwhile, combine vinegar, water, brown sugar and mustard. Whisk together until well combined. 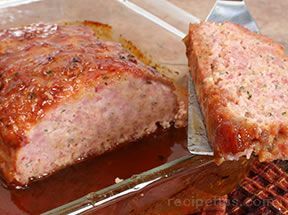 After the 30 minutes are up, pull ham loaf from the oven. 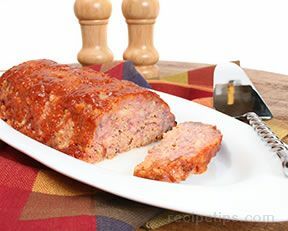 With a knife, score the top of ham loaf in a crisscross pattern. Spoon some of the topping mixture over top of the ham loaf. Place the ham loaf back in the oven. Bake for another hour, spooning a little more topping over the top of the ham loaf every 15 minutes. NOTE: Topping mixture will need to be stirred each time before it is spooned over top of the ham loaf because all of the sugar settles to the bottom of the mixture.